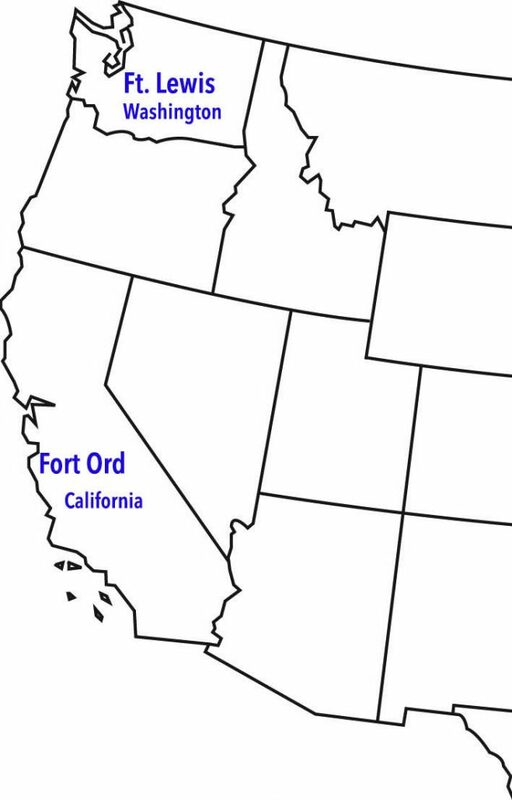 We arrived here at Ft. Ord on Monday at 10A.M. The troop train had been way ahead of time and consequently we were kept on a siding at Castroville (about eight miles from Ord) for almost five hours. Even at that, they unloaded us a half hour ahead of time and the trucks that were to meet us were not there yet. However, we finally were met by Capt. 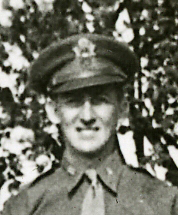 Collie who is personnel officer plus holding some other positions in the unit. We were taken to our present barracks, which are very nice. Each man has a separate room with a nice large window. We spent our first few hours hammering nails in places we wanted them, fixing a few shelves and clothes poles to hang hangers on. 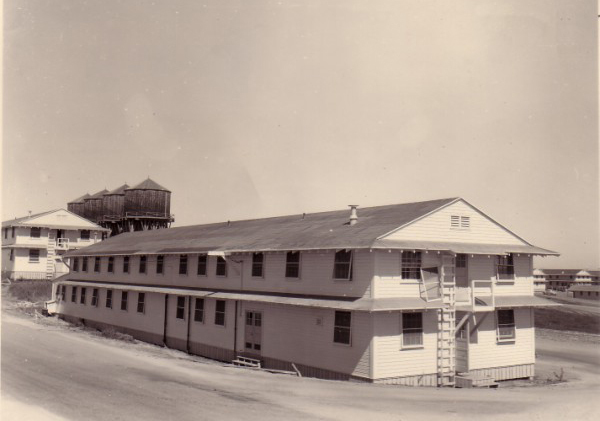 The barracks building is a 2-story affair with a washroom on each floor. A much nicer and more convenient set-up than at Lewis. My room is next to Serge’s and Bill Newsom’s and opposite Bob Treadwell’s, on the second floor. Monday evening, several of us went to Del Monte where the medical convention was in full swing. I was with Bert Halter, Ed Blaisdel and Cy Johnson and we proceeded to bump into everybody we knew — all of whom knew that we were arriving!! We finally slipped out at about midnight. We had until 1AM to be back here. For the past 2-1/2 days we have been checking and organizing the material that we have in the warehouse — 4-1/2 freight car loads of materials for the hospital — much more supposedly coming from N.Y. in the next couple of weeks. Our warehouse is in a reconverted barn that had mules in it up until the end of last week. We have about 90 tons of stuff there and most of it is in heavy crates. The trouble is that so many of the crates aren’t labeled correctly and consequently we had to open up many of them; i.e. had the men open them while we check the contents. It was kind of fun because we learned what materials we will have to work with, etc. As you no doubt gathered from my request for some of my communicable disease notes, we are at last doing something at least vaguely connected with the practice of medicine. We have to teach the enlisted men, by giving a series of lectures. Some of the surgeons lectured to them this week and miscellaneous subjects have been assigned to the rest for work-ups, though all won’t lecture on the subjects they work up. We are having uniform outlines so that all men get taught the exact same thing and we won’t have one group taught one thing and another taught slightly differently. We are also hearing talks of one kind or another presented so far by the 1st Med. Regt. One was on the sulfa drugs. That was a good talk but gave us nothing we didn’t know. The other lecture was on Australia, by a man who has never been there but who got what little he told us from books and from a few letters from a man with whom he corresponds. They have asked our group to contribute beginning next week and I think Roy Cohn will be the first with talks about his experiences in India. If our group can’t provide better and more interesting talks than we have heard from the 1st Med. Regt so far we will most certainly give up. Yesterday noon I was sitting close to the dining room door so that I could hear the telephone ring when you phoned. It was certainly good to hear your voices. The last few days have been rather uneventful. We have done a lot of routine things and had considerable exercise, yet the time has passed rapidly. Saturday morning we took a hike – in formation – just the officers – to the area where the men are going on this Thursday – where they will pitch their tents and have two meals. They will not stay out overnite. After the hike we got our last Tetanus shots – no casualties. We have two newcomers to the unit – both came on Sunday. One is Frank Lusignan, the neurosurgeon – a swell person. And the other is Marvie Kahn. You should all remember him as former President of the Student Body of Stanford in about 1934 or 35. Today the men started pitching the smaller tents and they had a lot of fun trying to beat one another. 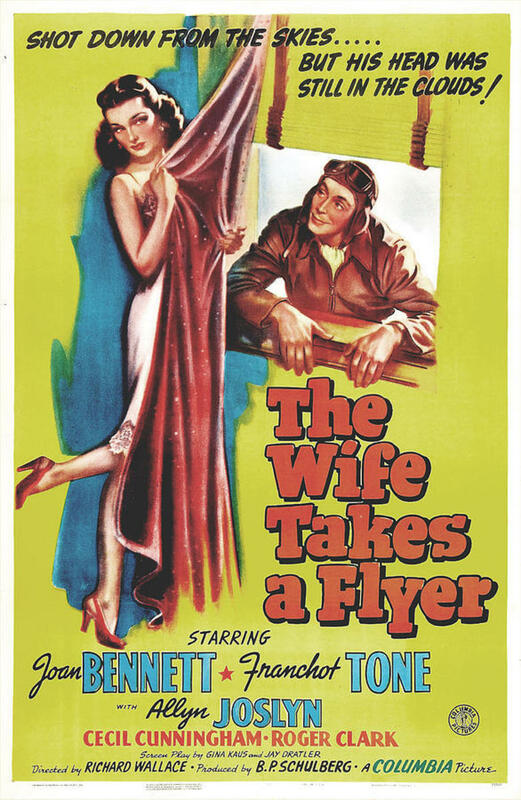 Tonight most of us went to see “The Wife Takes a Flyer” with Joan Bennett and Franchot Tone. It’s another satire on Hitler’s regime and is very good. About the weekend: The boys in the group that was off last weekend went to S.F. without mishap and without any notice of disapproval. It looks as if that practice is going to be continued until anything official to the contrary comes out. Therefore, I will plan to see you at dinner Saturday night as it stands now. However, I will phone anyway on Friday night. I will phone straight, so it better be collect, therefore, if you’re not in, have the call switched or something, or I can phone later. We have taken three pretty good hikes this week. Two were down along the beach and we found that we would not like to be sent to Libya, particularly if we are going to wear these heavy shoes. One sinks down so much in the sand that it is about three times the work that it is to walk on ordinary ground. We also climbed several sand banks along the beach, banks that went almost straight up and one slid down two feet for every foot taken uphill. We took one long hike that was on decent ground – about 9 miles. 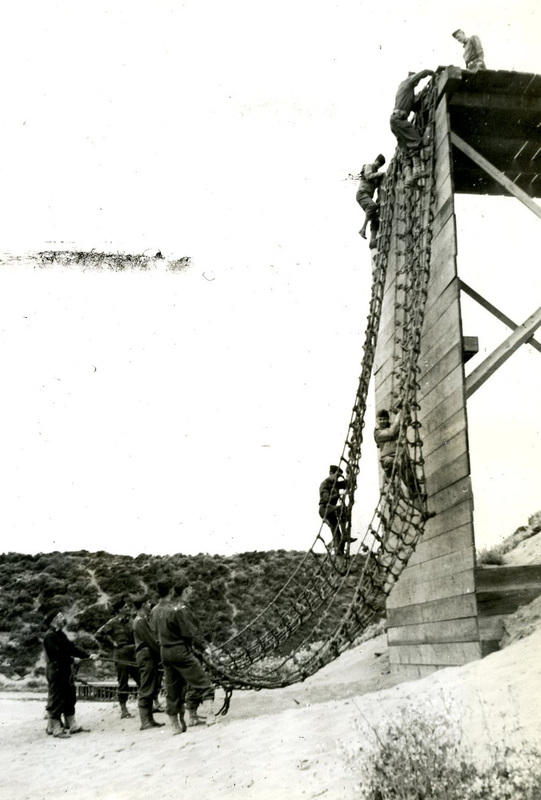 During that hike we also went over an obstacle course and landing net. As you know, the Pacific Coast is on the alert, so Salinas is about as far as we are being allowed – no weekends – all days alike, with nights off beginning at about 4 P.M. This kind of mixes up our pre-arranged plans, but how’s this for a suggestion: You come down Saturday or Sunday and then drive back up to S.F. on Monday A.M. Anyway, use your own judgment and let me know what you think best. Of course, if they decide to un-alert the Coast next week, then things will be changed again but I doubt if it will be that fast. Practice scaling a landing net. 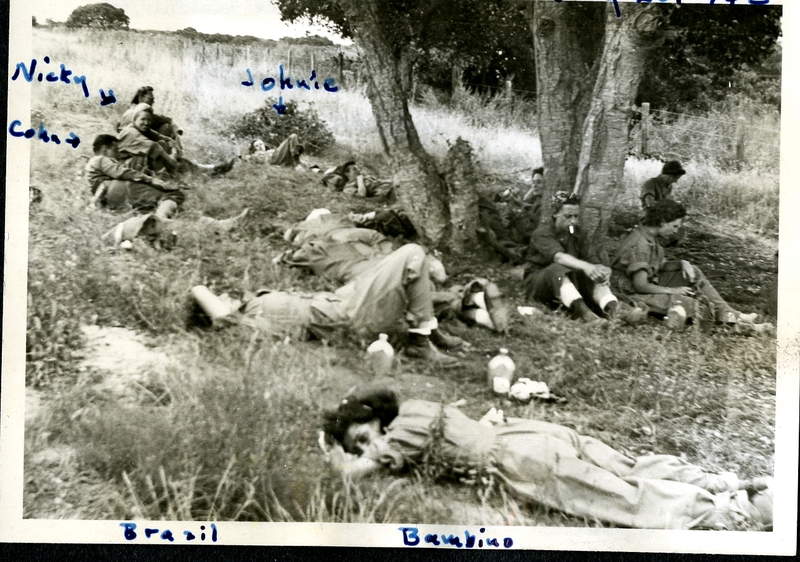 Nurses resting after a long hike. Yesterday I was Officer of the Day and spent most of my time catching up on my correspondence, as there were only a few duties attached to the O.D. However, since I had to stay over in the office and even sleep over in Headquarters, I was thankful that I had something to do besides read all afternoon and evening. 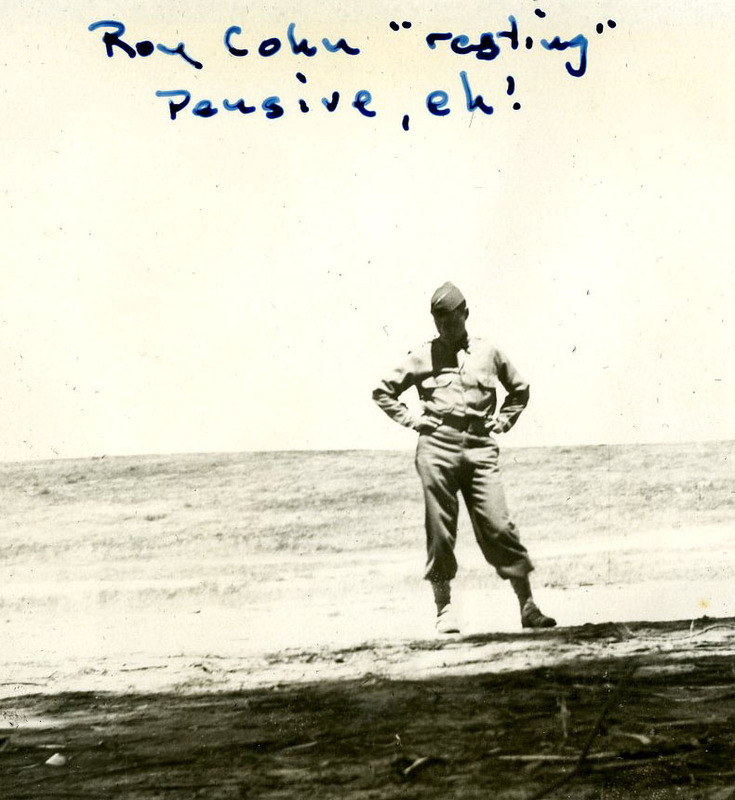 This morning at about 7 A.M. (on a Sunday, too, by gosh), I had to receive a radiogram and it was to inform Lt. Col. Bolibaugh that he could now wear the Eagles. Yes, he really was proud this morning and he took off his silver leaf in a hurry, was sworn in as a full Col. and appeared at lunch with his eagles. Incidentally, there is some rumor that Yehudi is coming here next Sunday – I wonder if there is any truth in it! 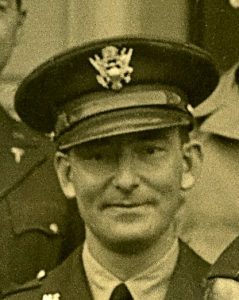 Colonel Oral B. Bolibaugh, M.C. Yeheudi Menuhin, musical prodigy, was a childhood friend of René. 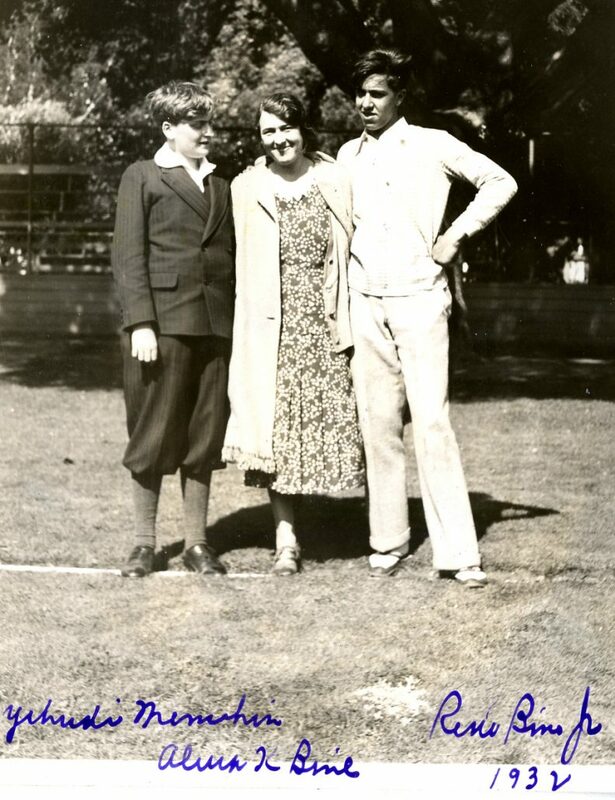 Shown here with René and his mother, Alma, in 1932. Roy Cohn was born in 1910 in Portland, Oregon and was raised in Southern California. He came to Stanford as an undergraduate in the mid-1920s, and received his bachelor’s degree in 1929. He graduated from Stanford Medical School (which was then located in San Francisco) in 1933. After serving as chief resident in general surgery at Massachusetts General in Boston, Dr. Cohn returned to Stanford to join the medical faculty in 1938. He went to India as a Rockefeller Foundation Fellow in 1939-41, helping to establish a major hospital in Bombay. 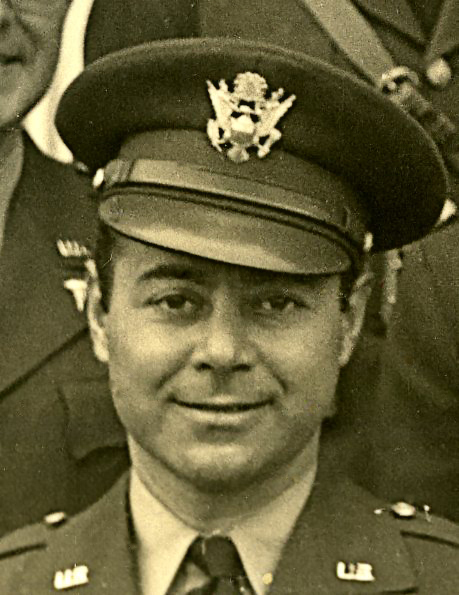 Back at San Francisco in 1942, he joined the 59th Evacuation Hospital along with his colleagues at Stanford. He was awarded a Purple Heart for his valor during the war. 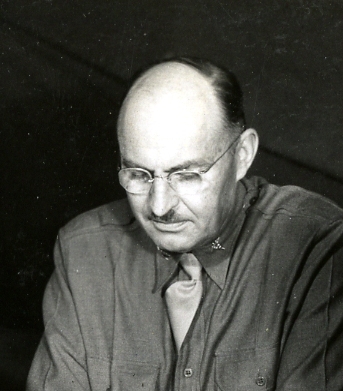 After World War II, he again returned to Stanford, where he published extensively and was highly regarded as a surgical innovator, teacher and mentor. 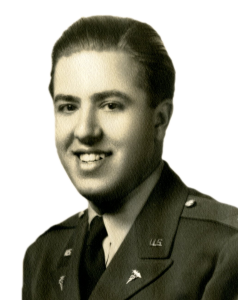 In 1960, Dr. Cohn performed one of the first kidney transplants in the United States, and the first kidney transplant West of the Mississippi. He also developed the kidney transplant program at Stanford and in 1964 co-authored a landmark paper in the field of transplantation surgery. In addition to Dr. Cohn’s pioneering work with kidneys, he also developed an innovative method for closing holes in the heart. As the science of transplantation advanced, Dr. Cohn and heart-transplant surgeon Dr. Norman Shumway recognized the need for the government and medical community to rethink the criteria for harvesting healthy organs. They urged that the definition of death be based on the cessation of brain activity rather than on the absence of a heartbeat — a change that helped make heart transplant and other organ transplant surgeries available to save the lives of thousands of people around the world each year. In 1974, he was honored with an endowed professorship, the Walter Clifford Chidester and Elsa Rooney Chidester Professorship in Surgery. The Roy B. Cohn Bioskills Laboratory in Human Anatomy at Stanford University is named in his honor. He retired in 1989 but remained active for several years. 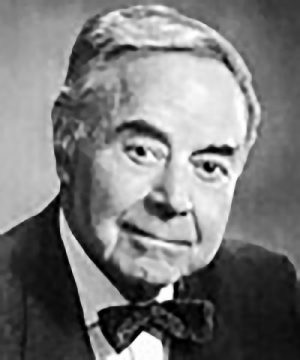 Dr. Cohn passed away in 1999. Thanks for coming down last weekend. Sunday was really a swell day and I hope that the lengthiness of the trip was worth it to you. This morning was routine, but this afternoon we had a demonstration of various gases, getting whiffs of all of them, and then staying in a gas chamber for about five minutes with masks on. The gas was “tear gas” and we found out that our masks were most effective. After coming out of the gas chamber we took off our masks and went through the gas chamber from front to back door, in a hurry, without masks. For an observer it certainly must have looked funny to see 35 officers coming out of that building crying profusely. Our enlisted men also went through the chamber same as we did. The nurses went through with masks, but not without them. 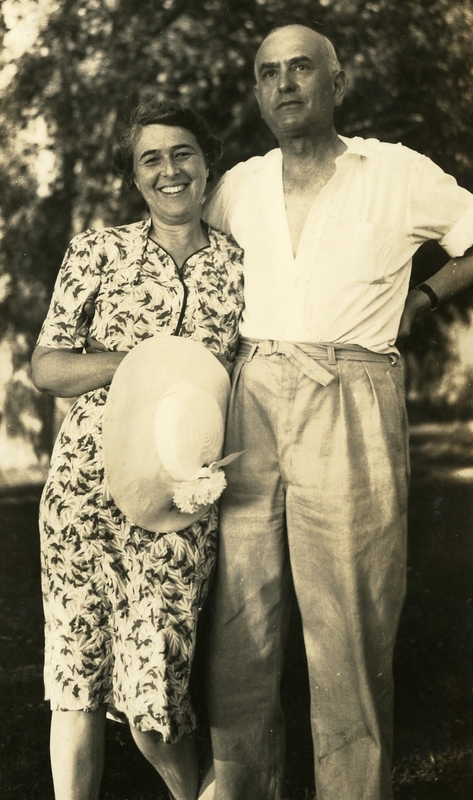 René’s parents: Alma Kahn Bine and René Bine, Sr., M.D.